Submitted by lynn on Thursday, June 23, 2016 - 1:21pm. I first heard of Pete's Seafood and Sandwich through several of my facebook food groups. This restaurant opened late last year in North Park with positive buzz so of course we had to follow up with a visit. We parked down the street and entered hungry and curious. 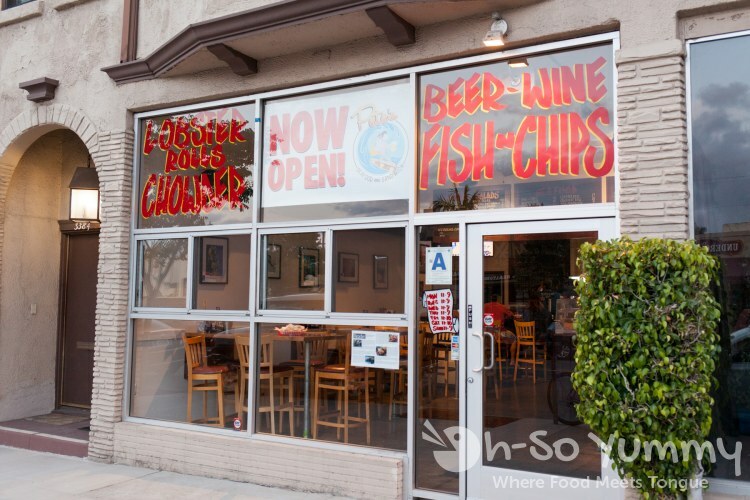 Dennis and I realized that the business at this location had changed again... Pete's Seafood and Sandwich had replaced Bazinga Eatery which had replaced Sea Rocket Bistro, chronicled through our multiple Taste of North Park crawls. Hopefully this place is here to stay! The menu was filled with potential food offerings, but we came with one item echoing in our brains... lobster roll. The cashier told us that each sandwich contained 5 ounces of lobster! We also ordered the chicken cutlet parmesan and two sides before taking a seat on the left side of the restaurant. Only one other person was eating still, working on the "small" fries. We were a bit shocked because it looked more like a LARGE! 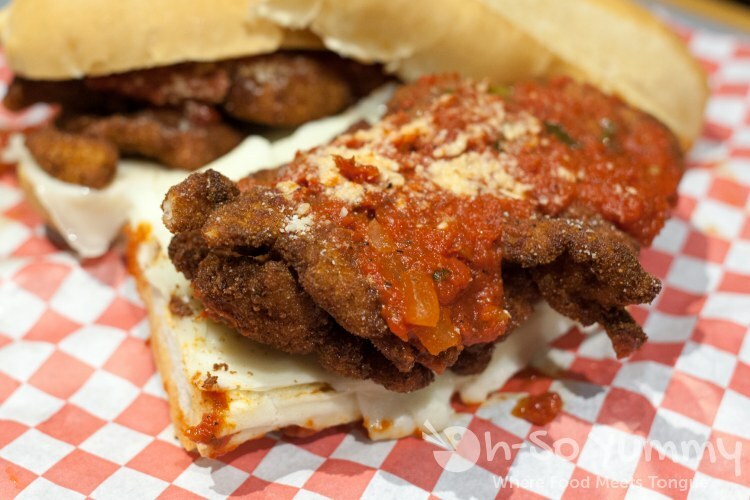 BUT it turned out to be the two halves of just ONE chicken cutlet parmesan sandwich! Food pictured is larger than it appears! OMG! Inside, there's two layers of chicken breast that overlap in the middle since one breast would not be enough! The chicken meat was very juicy with a medium crispy and well seasoned breading. 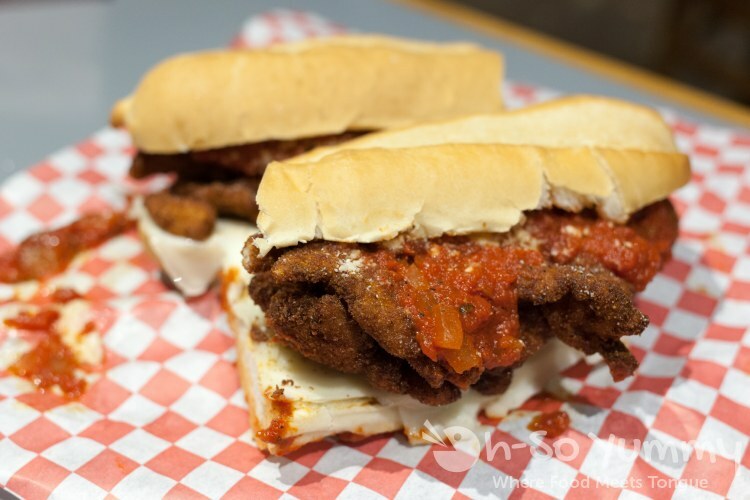 The thicker style marinara sauce and partially melted parmesan completed the sandwich. After taking a bite, we knew this would be an enjoyable meal. The only thing we'd change (or request) would be more sauce since you don't get full coverage as is! Not to mention, Dennis has always been a "dipper" when it comes to sauces! You can pretty much feed two regular appetites with one sandwich and a side! A few minutes later, the Lobster Roll arrived. It seriously looked tiny compared to the gargantuan chicken sandwich. After closer inspection, there are quite large chunks of lobster in it! A big positive was that it had less of that creamy mayo than other versions which allowed the lobster meat to shine through. The chilled lobster pieces were devoured quickly and happily. The bread seemed a bit plain to us, maybe because we've had supernatural sandwiches which was more toasted and buttery. At least it didn't outshine the meat! We like exploring clam chowder at different places. So we wouldn't have to fight over portions, we went for the larger bowl size rather than the cup size. 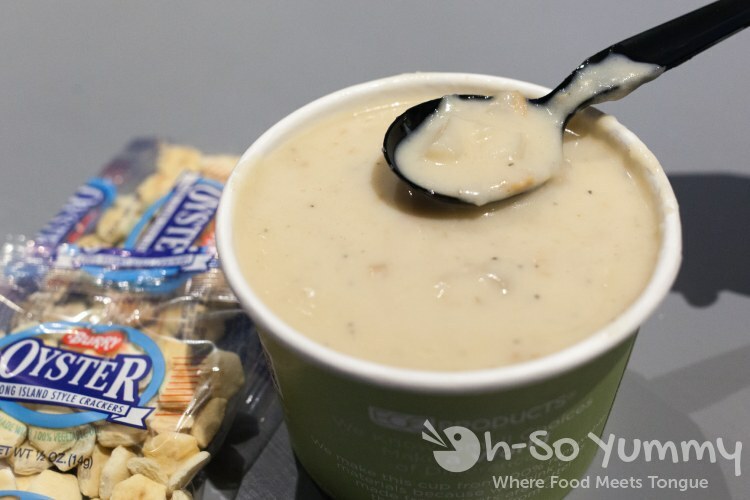 The clam chowder was satisfactory in flavor but the consistency was on the runnier side with less clams than desired. There was also a lobster bisque option that day (Mondays only) but we thought to save it for another visit. Since we weren't sure about portion sizes, we had ordered an additional side dish. 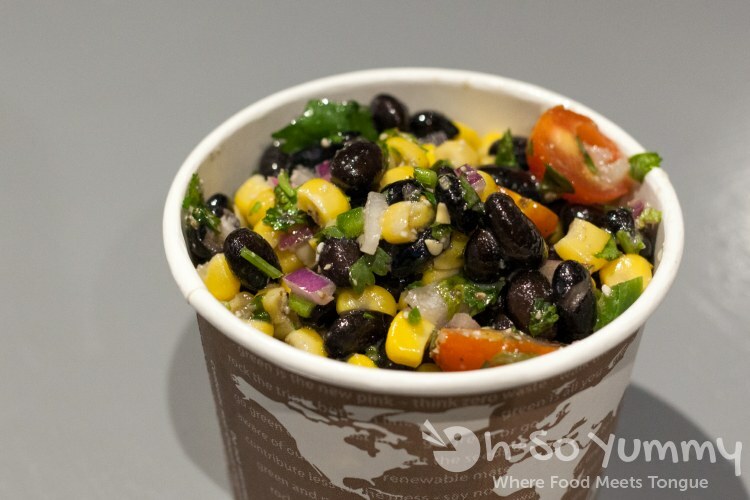 The ingredients were evenly distributed and fresh and felt very hearty with the proteins. This tasted great and reminded Dennis of the bean salad from Grand Ole BBQ! Since none of the sandwiches came with sides, the portion was perfect as an add-on. Sides aren't even needed if you're daring enough to gorge on the Chicken Cutlet Parmesan on your own haha! 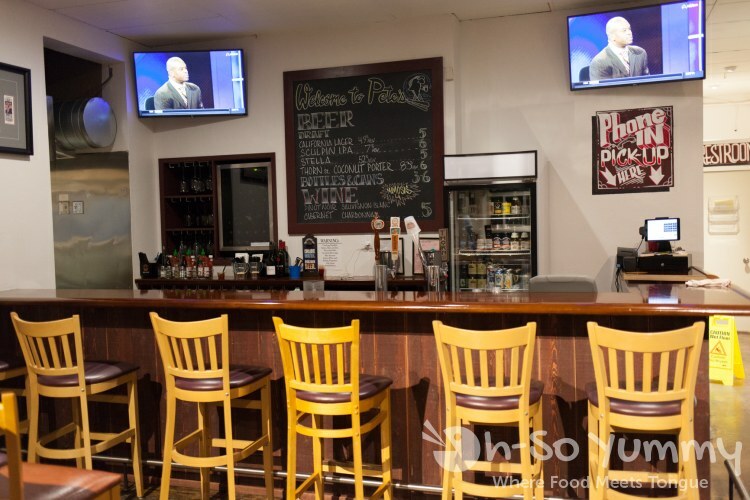 There's also has a few beers and wines available at their bar so grab a cold one at the bar while you wait. We went back for a second visit to try a few more items. We asked the guy working for recs and he named the Cuban sandwich. It was crazy the amount of meat that was spilling off the edge of this sandwich! We couldn't even pick it up to eat without starting at the edges first! 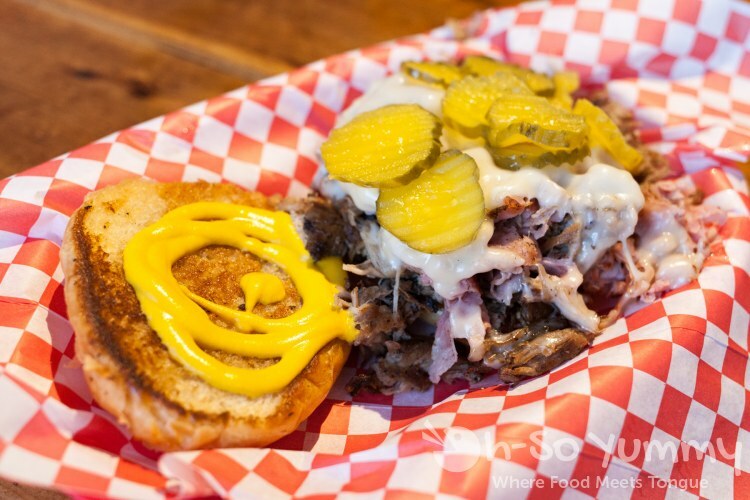 The meat seem dry at first but hitting a pocket of pickles and mustard brings it all together. This soft brioche couldn't really hold the heavy contents though. Also, there wasn't enough bread and we used a fork to finish off the meat. It's a big size sandwich that could have used a little more oomph. But if that's Boston style, so be it! I don't have the experience to know better! Clams and Chips ($14) - Ipswich whole belly clams lightly breaded and fried. Served with fries, coleslaw and homemade tartar sauce. I've never had fried clam before. These were flown over from the east coast and cut up into smaller pieces. 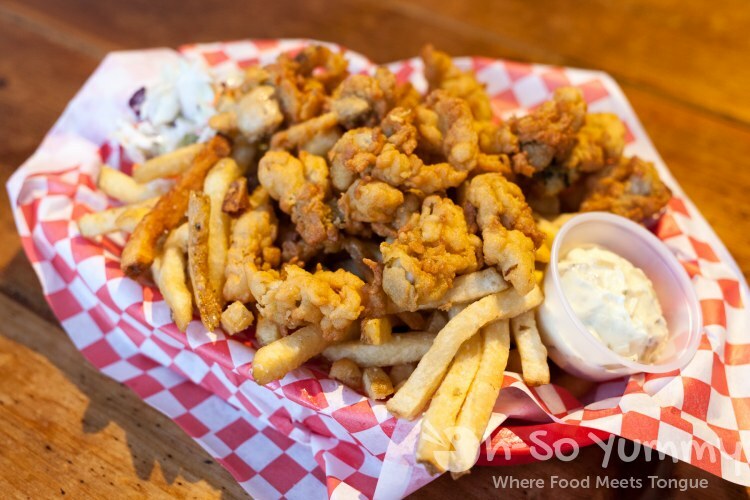 Portions were decent, perhaps 12-15 pieces of clam, and spread over a huge bed of fries. The batter was softly fried though a little bit oily for me. I guess I was expecting my mind to be blown based on reviews but I guess this wasn't my thing... Even the fries seemed just OK. This has been on my list for so long! That lobster roll is calling my name! i wanna eat a lobster roll at every [decent] place in SD. this goal is slowly inching forward! 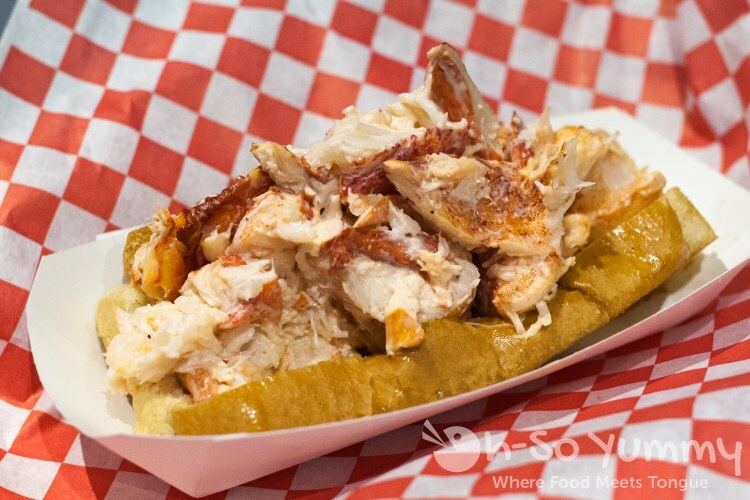 We're going to have to try that lobster roll for ourselves sometime this summer. That looked pretty good and very meaty! Side note - before it was Sea Rocket, that place was the original Linkery. I really enjoyed Sea Rocket but did not like Bazinga. I wasn't surprised it didn't last a year; I mean, just mac and cheese? Boring. I hope the seafood place lasts a lot longer than all of the previous tenants combined. ooh the linkery? apparently it didn't last in its new spot either (replaced by waypoint public). i remember sampling mac & cheese at bazinga during taste of north park and was not impressed... and now gone. becoming a successful business is hard! I drove by that place a few times. Been meaning to try the fish and chips. That's good you didn't have to wait in line like at Grand Ole BBQ. i look forward to your view on their fish & chips! i don't eat fried foods all that often other than chicken and fries! First time having fried clams?! Omg...you really had one of the best out here that I know of Lynn. DON'T order them anywhere else! The only other place I've had them out here was at Studio Diner. They also fly the Ipswich in from the east coast, but they're about $5 more than Pete's. i don't eat fried foods that often, especially seafood versions like fish & chips, but i'm often thinking about or eating chicken wings!